Farm Street Church. Farm Street. 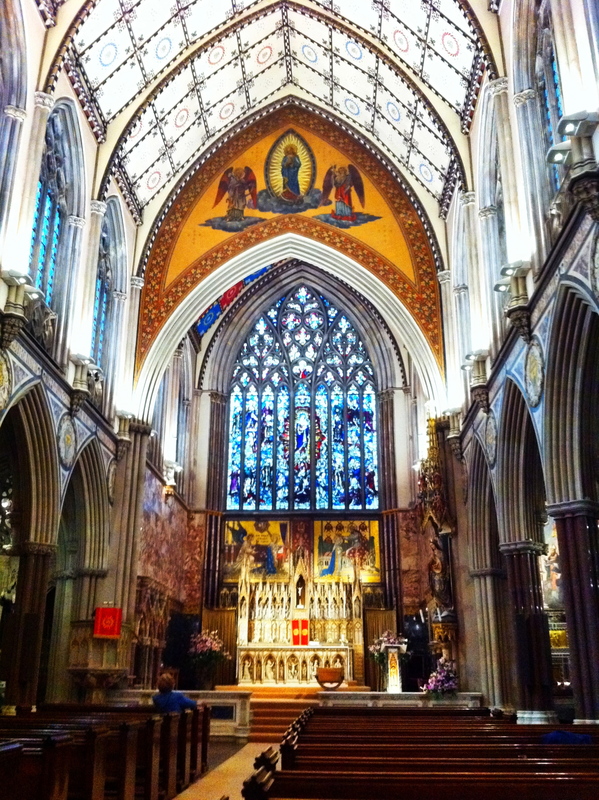 Mayfair. I’m now back home home in Jakarta after having spent the past two and half weeks in London. What a great holiday! Indulgent and hedonistic is probably the best way to describe our time away, and incredibly busy but in the loveliest sense.There was certainly never a dull moment with each new day jam packed squeezing in as many meetings with our children, friends, parties and functions, gatherings and happenings that we possibly could – exhilarating and quite exhausting. In truth, I need another holiday just to recover or some time locked away in a detox clinic. Two weeks is not nearly enough time to pack everything in and I didn’t manage to do half the stuff that I intended or wanted to, or manage to meet up with everyone that I had hoped to see, but we had a wonderful time seeing our children and the friends and family that we could, and that is what is important. 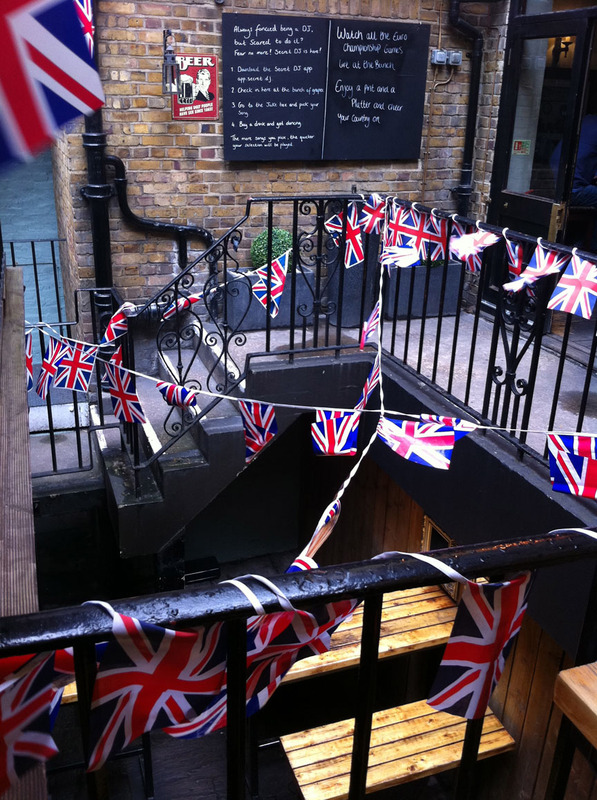 Decorations left over from the Diamond Jubilee celebrations. The Bunch of Grapes Pub, St Thomas Street. London Bridge. The primary reason (and excuse) for our visit back to the UK was because of the Irishman’s end of year doctoral Fine Art show and Presentation, which in case any of you were wondering went very well. It’s quite a terrifying thought that in a years time, if he behaves himself and does all the work that is required, that he shall be able to call himself a doctor – knowing what I know about him, he will totally abuse his new title and try to use it to it’s full advantage in the belief that he absolutely is a doctor – God help the poor person on an airplane at 38,000 ft who suffers a major coronary, or the unsuspecting woman whose waters suddenly break and starts to give birth – he’ll be leaping out of his seat shouting ‘I’m a Doctor, I’m a Doctor! clear the way….’ It’s probably best not to think about it too much, if at all. 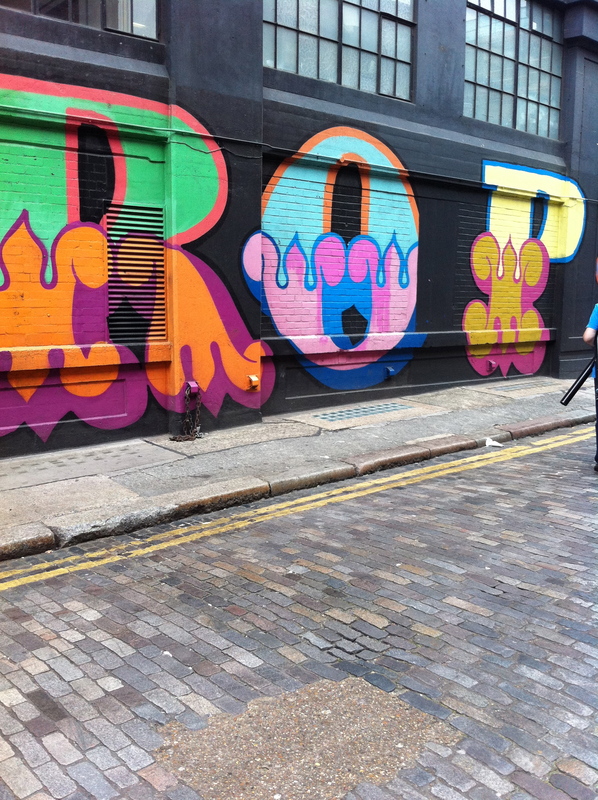 Our first few days back in London now almost 3 weeks ago, are a total haze. I’d like to lay the blame firmly and squarely on jet lag, but then 2 nights partying in a row ‘Enid Blyton’ style and too much apple juice (aka cider) certainly didn’t help the cause. This morning with healthful cup of green tea in hand, and in reflective mood, I’ve been looking back over the photographs that I’ve taken since we’ve been away and I feel inspired to write at least a couple of posts about London. 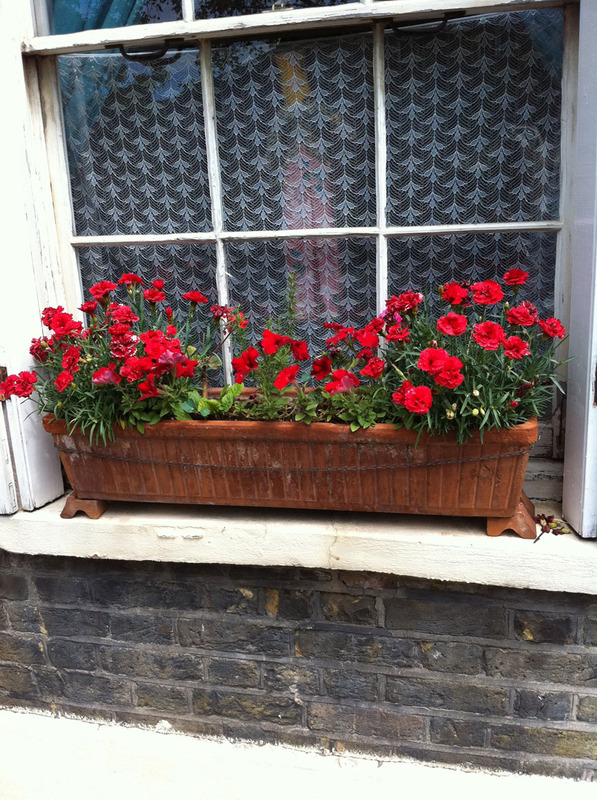 Window box in Borough Market. Strictly speaking my blog is primarily about my life here in Indonesia as an expat but if I’m permitted a little artistic license, I’d like to think that my visits back to the UK could come under that umbrella if only to show the contrast between our new life here and our old life in London. 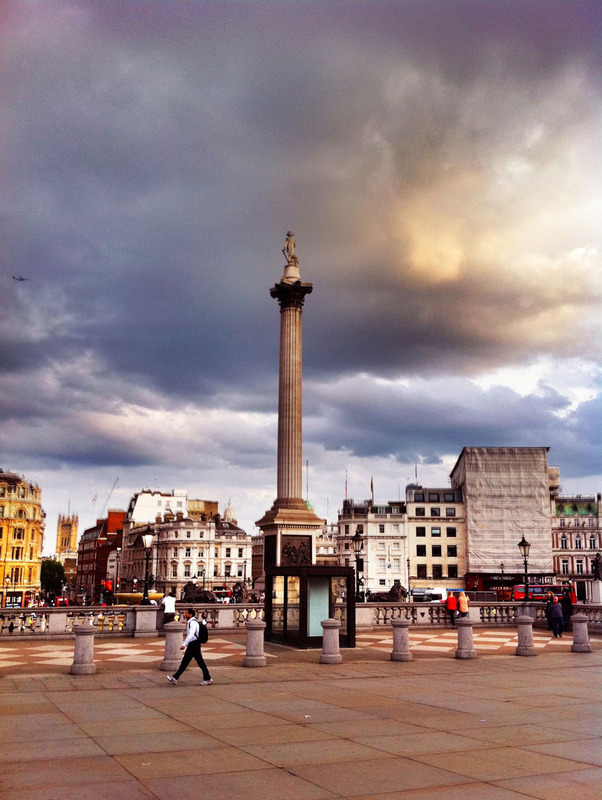 It’s also a great chance for me to show you London as a Londoner. 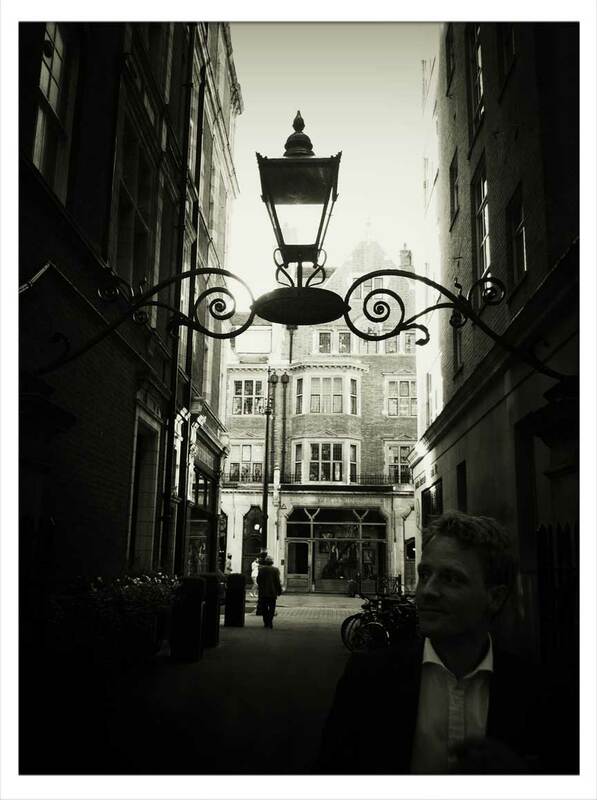 If you care to join me, I shall take you on a tour of the parts of London that I/We particularly love and the places that we visit, drink at, haunt, and generally hang around in whether we live there, or these days, return to as visitors. Hopefully it will be an informative and jolly guide that will maybe inspire you to visit London one day if you haven’t done so already. In the next few days I shall be giving you hopeless tips on places where not to go to get your beard trimmed, where not to eat if your name isn’t Rockefeller, Rothschild, Beckham or Windsor, what not to do when a mad man approachs your table in a pub, the best greasy spoon cafe in SW6 for a full English breakfast, plus other mad musings, ramblings, meanderings and factoids all about London, the place where I was born. 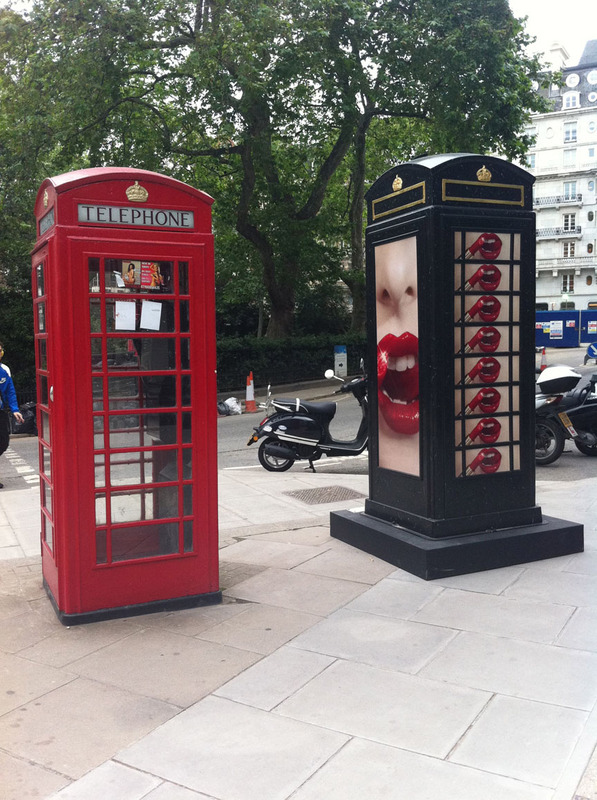 Phone boxes in Hanover Square. 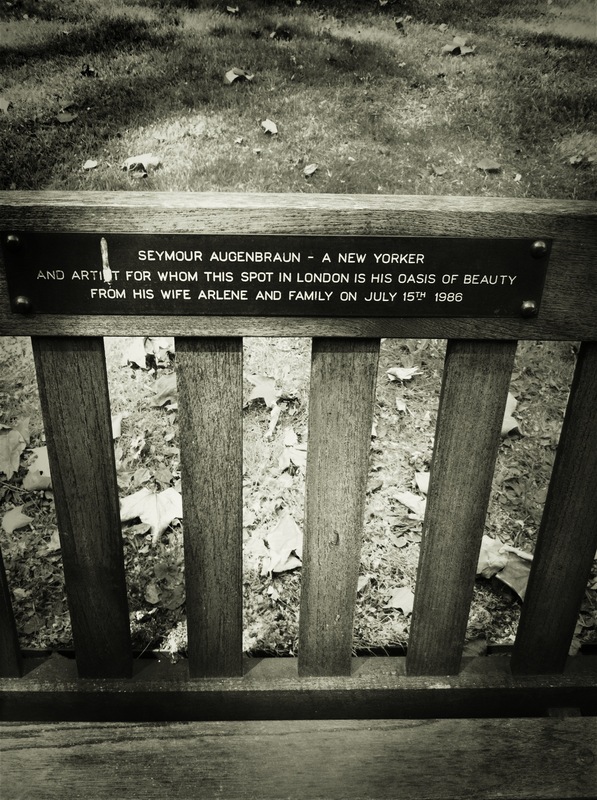 Memory plaque on bench in Farm Street Square. 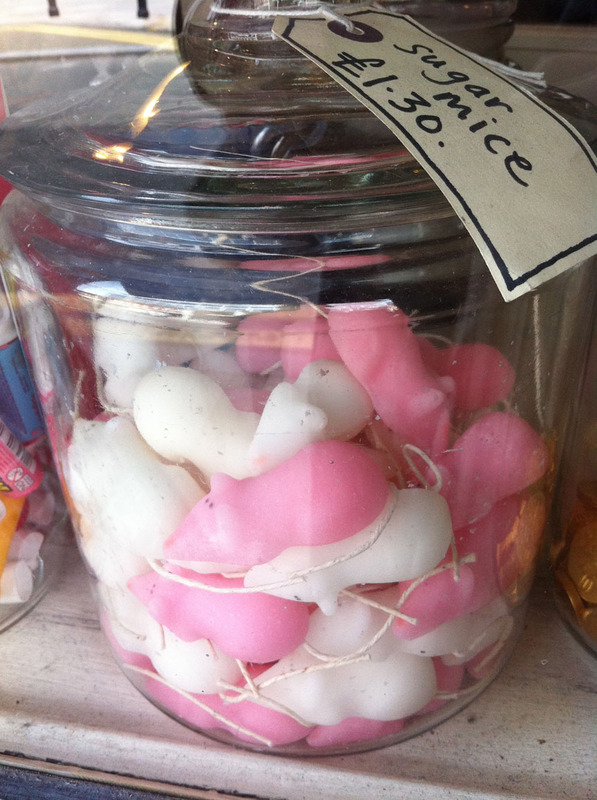 Sugar mice in shop in Shoreditch. Patriotic bottle openers. 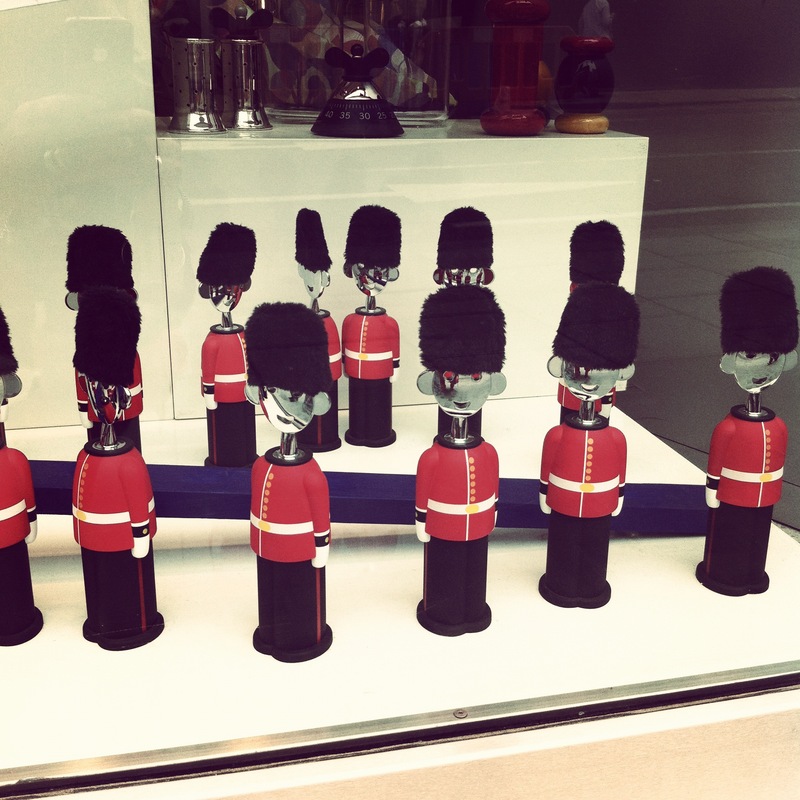 Window display, Bond Street. 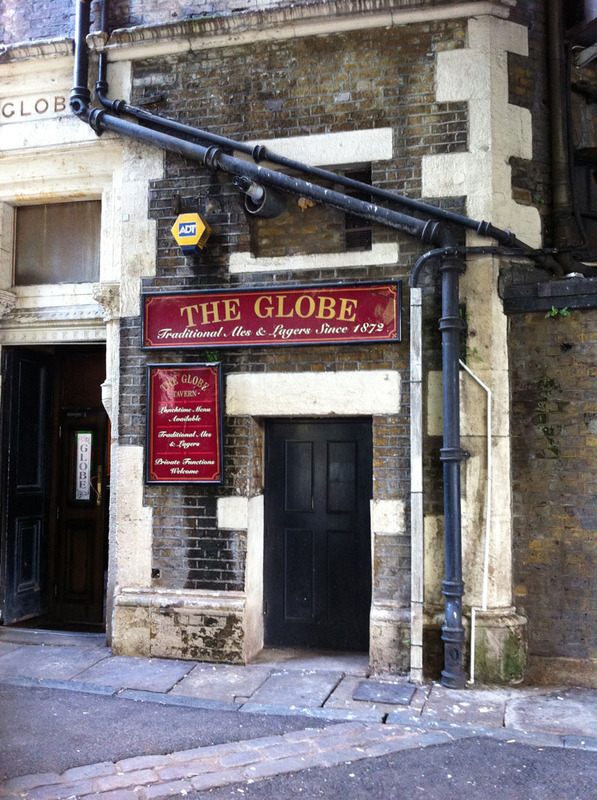 Globe Pub. Underneath the railway arches. 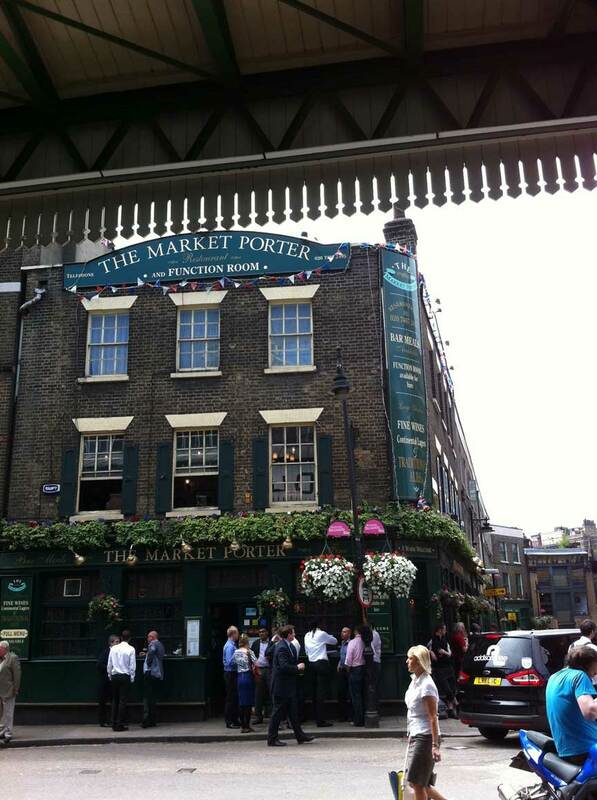 Borough Market. Passageway from gardens off Mount Street. Mayfair. 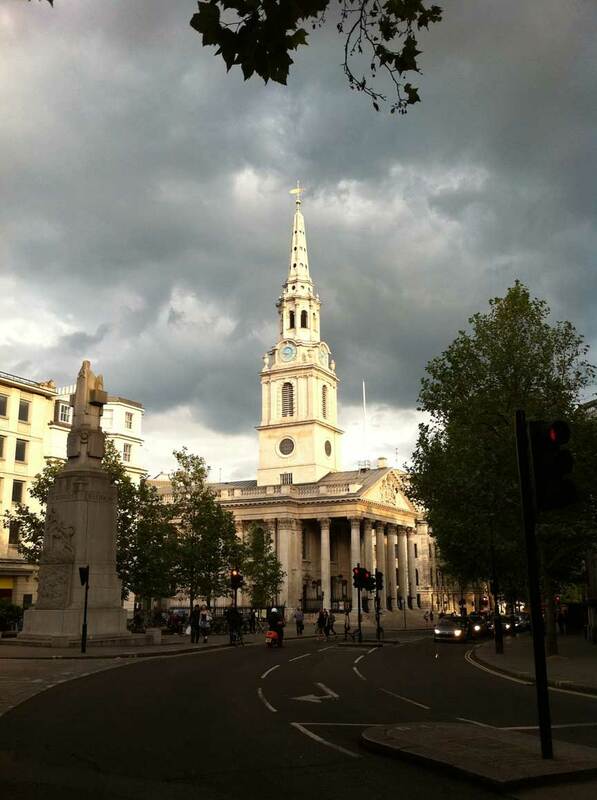 St Martin-in-the-fields Church. 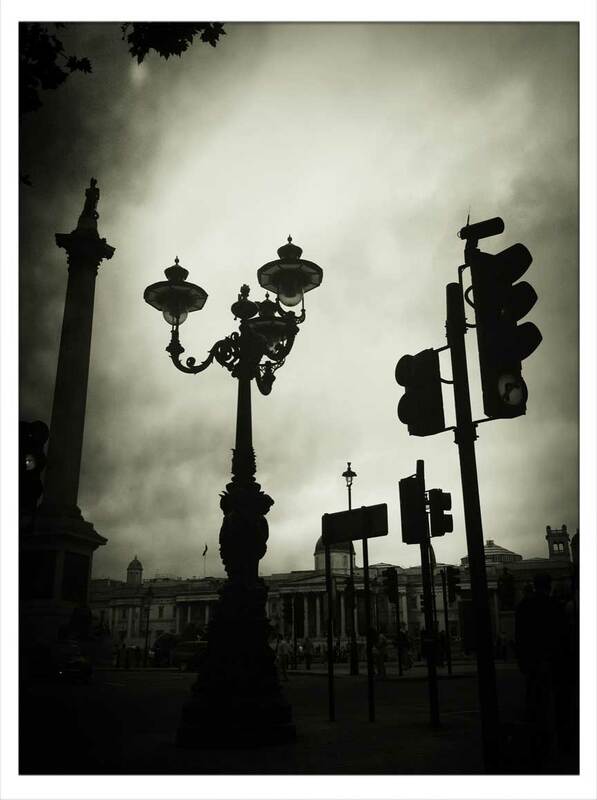 Trafalgar Square. And last but not least, HUGE thanks to Hedley and Sian for putting us up, and for putting up with us for 8 nights in Blackheath……Come and stay with us soon. Love the photos Lotts. Must go there sometime. Hahaha!! Great seeing you darlin’ and wish we’d had more time for proper catch up – we both thought of you as we supped on our apple juice outside The Punch Bowl last Friday night. I so wish one of your photos had been a blue box labeled Police Box. Here’s to hoping. I’ll head straight back now and find one for you………. Thank you so much Lottie i appreciate that! If you are ever here in Oklahoma I welcome you here as well 🙂 I would love to get to travel but having a small child and finances never seem to let us. We do go places but its usually things that are close or within a few hours. Firstly, All Hail Lottie’s Blog Return! Hooray! Sounds like you had a fabulous, though exhausting, time of it. Two weeks just isn’t enough, is it? Your head must still be spinning, but I’m sure the green tea helps. I’ve only been to the UK once and it was for three weeks. It went by in an amazing blur. I cannot wait to go back. 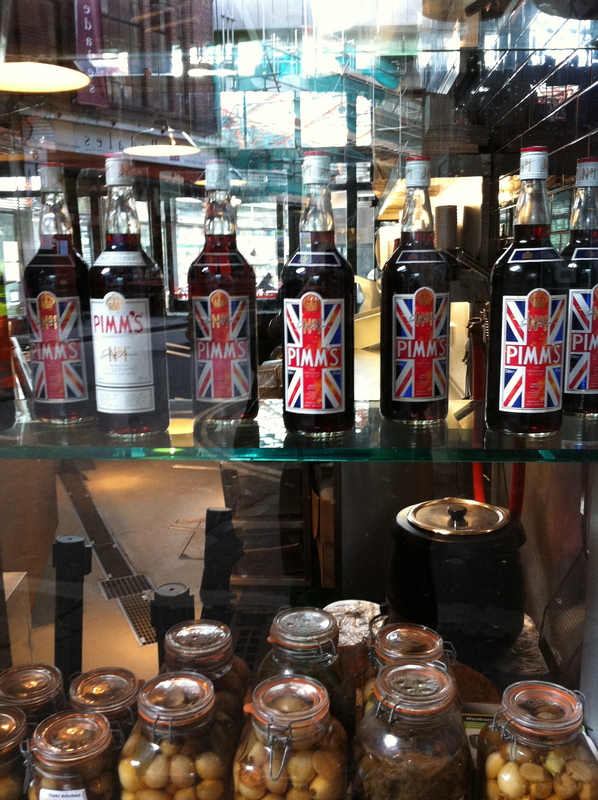 In the meantime, please do be my British fix! Besides, my absolute favorite musings are mad ones! I cannot wait to read your upcoming posts on London. And more fabulous pics, too, please? I’m glad you liked the photos. The sugar mice are very old fashioned and tradtionally put in children’s stockings at Christmas. I found these ones in the window of a grocery shop that is owned by the artist Tracy Emin in Spittalfields Market. I’m still wading through all the washing and sorting out stuff now that we are back but shall be on with next London post very, very soon. I mentioned the sugar mice to my husband, who merely said “ohhhh.” Drooling was involved. Hah! And I cannot wait (but I will) for your next post! What a brilliant read – and those photos! Loved them all. We were in London in 1997, November, with Diana-mourning still fresh. Haven’t been back. Must make plans. Definitely time for you to go back! 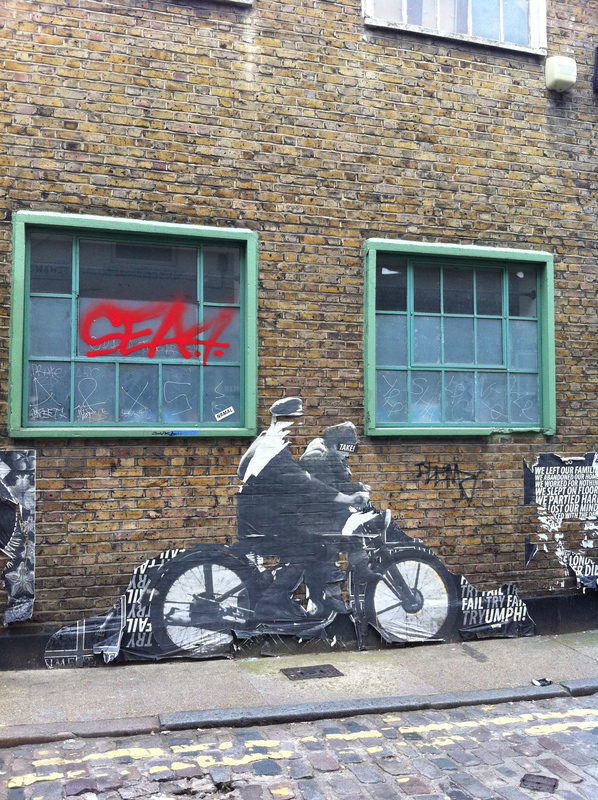 My next couple of posts are going to be about places that I love in London – I hope that they will inspire you to make plans. How is your book going? I’m really looking forward to reading it. 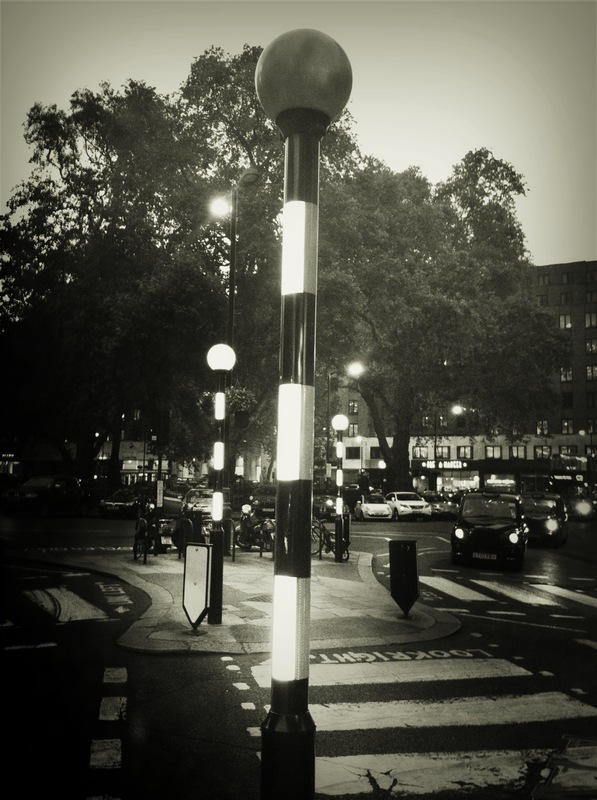 I have never been to London-so why then did your pictures make me home sick?